Oxford Nanopore Technologies said it has raised £100 million ($140 million) in new financing, with plans to use the proceeds toward commercial expansion efforts, including a new manufacturing facility, and the development of new products. The developer of the pocket-sized MinION real-time DNA/RNA sequencer and other nanopore analysis devices said the funds will support its next phase of commercial expansion. That phase will include a 34,000-square-foot manufacturing facility in Harwell, Oxfordshire, within the 710-acre Harwell Science and Innovation Campus. 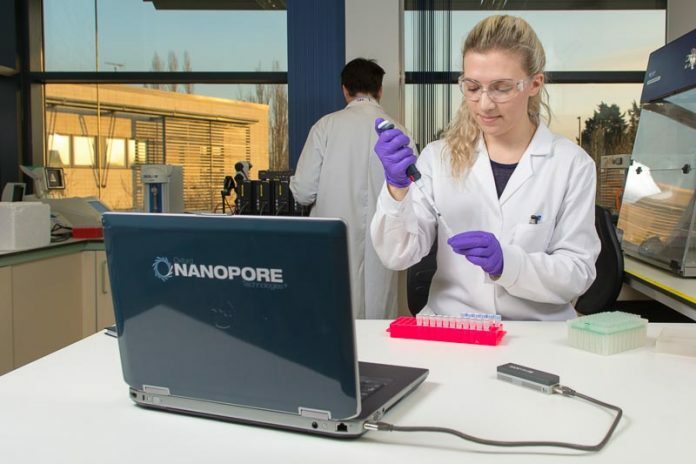 Oxford Nanopore said the facility will enable it to meet growing demand for its sequencing technology by enabling the company to manufacture and distribute its DNA/RNA sequencing products in one site specifically designed for the purpose. STFC has offered continuing support for Oxford Nanopore’s manufacturing operations, as have the Innovations Technology Access Centre (ITAC), and the joint venture team that runs the Harwell campus. ITAC includes £10 million ($14 million) in lab and clean room equipment, and serves as STFC’s business incubation facility for companies in bioscience as well as energy, the environment, space technologies, advanced materials, and chemicals. Oxford Nanopore’s MinION sequencer has been at the center of two recent milestones in sequencing: In December, researchers at the Garvan Institute in Sydney, Australia, announced that they used MinION to sequence a single DNA read of more than one million bases long. And in January, a research team reported in Nature Biotechnology how they were first to use a nanopore sequencer to assemble a human genome using ultra long reads, closing 12 remaining gaps in the reference genome. Oxford Nanopore said the financing will also be used to support additional R&D as the company expands its suite of devices. In addition to MinION and the GridION X5 desktop nanopore analysis device, the company is expanding its offerings with the PromethION benchtop high-throughput modular sequencer, designed to run up to 48 flow cells at any time and available through an early-access program; and Flongle, an adapter (flow cell dongle) for MinION or GridION designed to enable direct, real-time DNA or RNA sequencing on smaller, single-use flow cells. By expanding its offerings, Oxford Nanopore reasons, it can address more segments of the DNA sequencing market. PromethION is intended to enable large-scale, on-demand sequencing of human, plant, or animal genomes; while Flongle is designed to enable the rapid real-time genetic analysis of infectious diseases, targeted analyses in precision medicine, food and/or water-safety surveillance, and science education. The company’s suite of offerings is also intended to enable direct RNA sequencing, as well as provide full-length transcript and viral genome profiling, precise quantification, the ability to identify modified bases in real time, and simplifying workflows. Oxford Nanopore added that the financing will enable it to expand its commercial staff, which now serves more than 70 countries. Headquartered in its namesake Oxford, UK, and Cambridge, UK, Oxford Nanopore maintains commercial operations in New York and Cambridge, MA, as well as in China, Japan, France, and Germany. The company said it recently opened its new Oxford HQ, and is opening additional offices in Shanghai and San Francisco. Dr. Sanghera told the newspaper 6,000 MinION sequencers are in use worldwide, with applications including tracking the ebola virus across west Africa, and researching zika in South America. The financing, he added, would help keep the company independent, and avoid the fate of his previous employer Medisense, a glucose monitoring business sold to Abbott Laboratories in 1996 for $876 million. The financing attracted global investors that included the Singapore global investment firm GIC, Chinese-owned investment services company CCB International, the Australian fund Hostplus, and existing investors.